Got a lot done on my Twister wing. All nice and straight so far. The full ribs are glued in place and tomorrow I'll add the half ribs and bellcrank platform. I mounted the canopy and pilot on my Ares then using micro balloons and epoxy resin faired the edges of the canopy into the fuse. Looks great! Then I fiberglassed the top of my Strega in the area where the canopy is going to be mounted. I love building on cold winter days! You're using that "old school" stuff? Wing and fuse joint? Micro-balloons there also? Did you see how I did the canopy on the Gee Bee R-3, I mixed black paint with the Micro-balloons. I'll use that mix on all joints. Today I silked my GBR3 rudder this morning. Dry silk applied using CA. One coat of dope. One small wrinkle but it comes out with heat, so dope should take care of it. I printed out some more "Cicada decals" these are free to anyone that flew at Brodak's in 2016 and might like to have a decal as shown. Under the picture it reads..."I flew at Brodak's in 2016" I am running out of decal paper, but will re-order and mail yours ASAP. Hmmmm...I understand that the airplane will fly inverted, but how did you get the bench to do that also? I admit that I do trial fitting sometimes also...just gotta' see it! Some of us are just more thorough than others, Randy. Made an attempt at setting up a usable space to build in. Its a problem to set things up in advance considering what was in all the wrong places before. Trying to use kitchen set up where most things are easy to get too and not have to run around trying to find things and then forgetting what I was looking for. Oh yea and found a picture of Paul Walker's B-17 and posted on Facebook. Up north we build in zero gravity to avoid warps! Yeah, I figured it was something like that. Unfortunately here in the Southwest we're realists and forced to live in reality! Incidentally, the only way I could make the image appear right side up was to open it in Adobe Photoshop! Of course Photoshop is the ultimate in Non-reality! Woke up to below zero temperatures, went to the gym, stopped for groceries; then shovelled snow all afternoon. Heck of a way to spend a Saturday. Do you realize you now have immortality with this Thread? I cleaned my work space today to get ready for the mounting of my flaps and for prep work before covering the wings with silk on the Gee Bee R-3. Rain and very cold air here. Got to sand wing panels and install a leading edge. Ooops, well now it's yesterday as I didn't get around to posting it then; but I hosted a building session in my shop and 4 club members dropped by (despite the snow) and we worked on our toy airplanes. "A toy airplane is something you wind up and it rolls along the floor" "A model airplane is something entirely different." I think I got that line correct? I don't miss the winter or snow, but it did give the opportunity to get things done. Ok, here's what I have been doing for the past month; NOTHING! To cold in the garage, I mean shop, to spend any time with this (Bleeping) cold. Hacking, coughing and snot running everywhere. Sure sounds like fun don't it!? Better days are coming! Yessss! Sounds like a good time to bundle up in front of the TV! Get better! Someone else's definition. Not mine. If I want to call them toy airplanes, I'll call them toy airplanes. This morning, opened the shop door to find what looked like a dead 'possum. Poked him with a broom, then I had an angry 'possum. Must have locked him in last night, spent the rest of the day trying to straighten the mess he made. Norm, in the wilderness of suburban Los Angeles! Good progress this afternoon. Jamison is starting to look like a flyable toy. 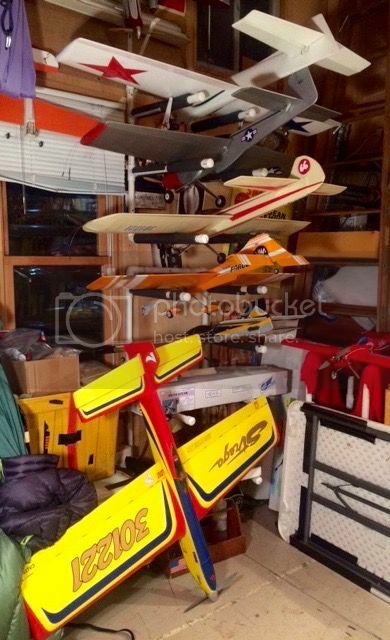 Yep, they're all toy airplanes. Thats funny at some level. However, it sounds like a real-life nightmare. Best of luck with the clean-up. Charles back in the day I liked to use polyester resin with hardener mixed with micro balloons. I thought that the resin cured to a harder finish than epoxy resin. However, the polyester stunk up the entire house. When I use the epoxy resin I mix part A equally with part B then the mix with an equal volume of 91% rubbing alcohol. I add the micro balloons slowly to get the thickness I need for filling. Once the mix is applied I wet my finger with the rubbing alcohol and smooth in the fillet. I have found that only one coat of the epoxy resin,sanded then filled with some type of sanding sealer is more than enough adequate to get a very nice glossy finish using Rustoleum spray enamel out of a rattle can. No, it's not a 20 pointer at the Nats,but still very nice and fuel proof if you let it cure a few weeks. Well for the last 3 months I've been trying to get my shop in order. Hit a few bumps along the way but, such is life! I pulled all the saws, planer,etc. out and painted the floor. Put a small wall dividing my shop from the furnace and hot water heater etc. Just finished my racks for stunt ships and wings, etc. Bought myself a TV for christmas. Don't feel bad, I stunk up the basement but opened the windows. We used Polyester resin also, all of us did. Glassed the wings and fuselage with it also. These two canopies were done as you described, with Epoxy. Micro-balloons aren't for everybody. Tried my hand at making a pilot bust for free flight scale. Made it to see which materials and tools worked best rather than attention to anatomical proportions. It looks like a mummy because the eyes are in the wrong place and the head is too fat! I would report on shop activity, but some times I skip a day or two with family matters. Now both you guys want to come help the old DOC refurbish his shop? I keep thinking of a storage unit to move every thing to, but I've read a couple of horror stories on here. The floor needs complete replacement as the so called marine/water proof was not. Even the underlayment for the linoleum is gone in places. Right now I'm working/playing with four different planes and getting ready to make leading edges for an old time combat plane. The wood shop I had built off site, and I specked double floor... but it needs paint. I went to and through my shop several times today, installing two required-by-the-city Carbon Monoxide Sirens and an owner's choice water siren in the catch tray under our new hot water heater. Also installed a clothes hook on my closet door and repaired a troublesome kitchen tool for the wife. Well, because I'm dead in the water waiting on a part, I cannot work on the Gee bee R-3. Sooooooo, I tweaked the plans a bit for the stunt biplane pusher I'm designing. I finished prepping two Thunder Gazer, one Parrot P-40 and one Sig Chipmunk wings for covering. The Thunder Gazer wings weigh 8.5 and 8.9 oz. The Chipmunk wing weighs 11.5 oz and the P-40 checks in at 10.9. I just let my grandson run around and have fun. Maybe I'll get around to laying tape and paint. Continued building my new wing for the Twister. I'm using more CA on this thing than I ever have before. For the sake of speed. I'm not so sure it's helping with that so much, but it seems strong enough, and it coming together straight and true. However I keep having to go to the lame local "craft" store with my digital scale because I don't like one piece of wood or another. That stupid store does not sell thin CA, nor do they sell CA applicator tips or K&S metal products. Despite all that, it's a few sessions away from being ready to mate with its fuselage once I clean out the leftovers of the original wing. I just kept being distracted by my fleet whilst practicing juggling and working out. To dream to fly. Yeah, I bet it's hard to juggle while dreaming of pattern flying. Safer than driving and daydream flying though... unless you're juggling hatchets, Lol. 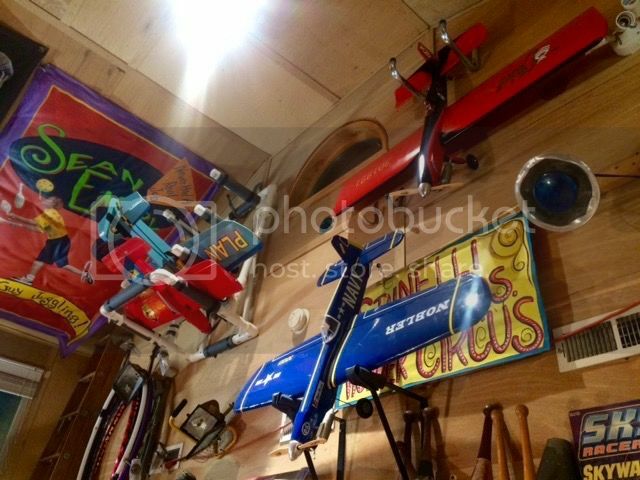 Nice looking fleet in your shop, the Strega is a great addition too, I enjoy watching it fly. Wayne has one he wants us to try out this weekend. I'm leery of trying it though, I'm not sure I can be the boss of a plane that size. You're almost as bad as Me I have six waiting for covering and one waiting for the white coat! Collossus (waiting for white), Whitely Shoestring, Trivial Pursuit, Tempest II, 700 SQ in. Original (as yet un-named) "The Beast" has been suggested by Randy Powell , and another 650 sq in original based on a Hunt Saturn wing! Don't know where to start anymore! My other shop room. My O Scale layout, still under construction but I had to make sure everything worked. Okay. you guys have given me guilt feelings. So...I got busy and spent a couple of hours on a project I have planned for several weeks. Like several of you, I am in the process of setting up a new shop, or some of us are reorganizing your existing one. I dug out the plywood and mover's dolly and went to work. Since I have two area where I do different glue-ups and clamping during guitar builds I wanted to be able to wheel it around easily. Here's pictures of the four different sides, one per post. The one inch of snow we got last week here in South Carolina is now gone and it was near 75 F yesterday! I took advantage of the comfortable temps in the shop and got the wing glued in, the stab and elevators covered, the controls installed and adjusted and I'm ready to glue the stab in place. Couldn't help myself, I had to set the pilot in place with the malcom hood for the photo!